Powerful words. Two words that can be looked at as a command, a mission or a lifelong vision statement. Words that can haunt or inspire when faced with impossible challenges or mundane daily living. Words that can cause you to live to the fullest: or at least make the attempt. 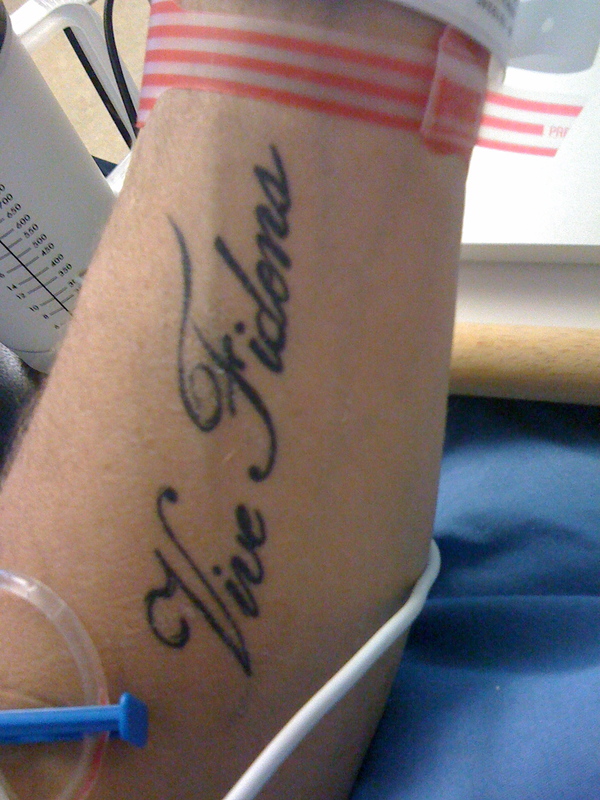 Vive Fidons are the words tattooed on the arm of one of the Arnold brothers – it means “Live Courageously”. These tatooed words are the reason I am writing these thoughts today. In everyday life, what does it mean to live courageously? As a parent, a husband, a wife, an employee, a student, a teacher, a priest, a soldier, a citizen…How do we live a courageous life? I have my own ideas and concepts of what it means to live courageously. But my own ideas seem insignificant when I witness someone wrestling with life in a way I can’t comprehend or I see someone who gave their life away…courageously. The story of Chad and Ryan Arnold continues to haunt me, challenge me, provoke me, break me. Ryan donated part of his liver so his brother Chad could live. Then, Ryan passed away. And Chad lives on…attempting to “Live Courageously”. I read his blogs often. Why? Because Chad’s honesty about his journey is strangely refreshing, compelling and blunt. Honestly, I grow weary of hearing empty words from people who have developed life concepts and beliefs in faith, but have never truly been challenged. When, I read of the honest journey, thoughts and struggles Chad and his family are wrestling with, I want to live courageously. Why? Because, though his questions are many and the answers are few, Chad continues to have faith in God. That is faith that is real and compels me to cry out “VIVE FIDONS”! Live Courageously. If you want to see a picture of real life, real struggle, real faith…check Chad’s blog and read for yourself. After reading Ryan’s/Chad’s story on msnbc.com, I searched for their blog and read several entries and noted Chad’s tattoo. I ran a search for the meaning and your post is what I clicked on first. How perfect and thank you so much for researching and sharing the meaning of Vive Fidons and about sharing your faith. I’ve had similar feelings to what you shared… provoking, inspiring, and nearly awestruck in reading about their journey. I will be amazing to see Chad’s journey progress as God’s plan begins to reveal itself more each day for the glory of His Kingdom in working through the Arnolds. Amen brother!